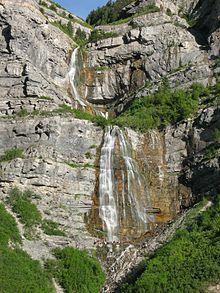 The area was originally called Timpanogots (meaning "rocky") and was inhabited by the Timpanogos. 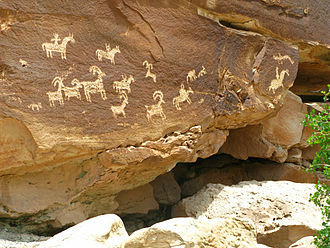 It was the largest and most settled area in modern-day Utah. The ample food from the Provo River made the Timpanogos a peaceful people. 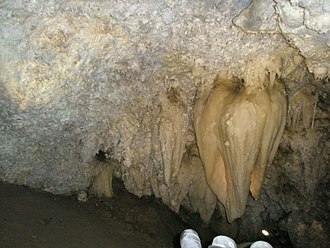 The area also served as the traditional meeting place for the Ute and Shoshone tribes and as a spot to worship their creator. Provo has more than 100 restaurants (with over 60 in the downtown area) and a couple of shopping centers. The Shops At Riverwoods and Provo Towne Centre, both shopping malls, operate in Provo. 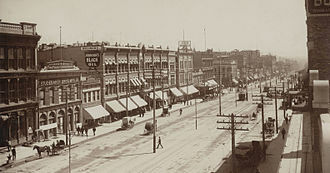 Several small shops, music venues and boutiques have popped up in downtown, along Center Street and University Avenue. Downtown has also begun regularly hosting "gallery strolls", held every first Friday of the month, featuring local artists. There are many different dining establishments in and around downtown Provo. A few exclusively downtown Provo examples include A Beuford Giffords, aka ABGs, one of only three bars in all of Provo and the only bar to host live music every weekend; and Tommy Burger, a burger stand noted for burgers and Chicago-style hot dogs. The Provo City Center Temple used to be the Provo Tabernacle, an LDS tabernacle completed in 1898 that is owned by the LDS Church. 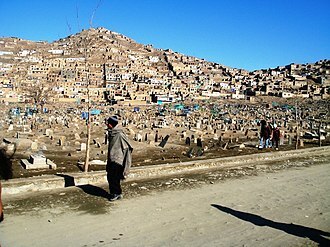 It was almost completely destroyed by fire on December 17, 2010. 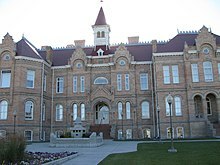 Only the brick skeleton of the Provo Tabernacle remained at the corner of 100 South and University Avenue. On October 1, 2011, Thomas S. Monson, president of the LDS Church, announced that the Provo Tabernacle would be rebuilt using the surviving original exterior to serve as a second LDS temple in Provo. The completion of the new temple will make Provo only the second city with two temples within its city limits, the other being South Jordan, Utah. 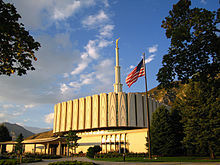 It is also only the second instance of a tabernacle being repurposed as a temple, the first being the Vernal Utah Temple. 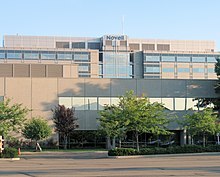 Provo is home (or hometown) to many well known people, including The Osmonds (including Donny, Marie, and the Osmond Brothers), LDS apostle Dallin H. Oaks, and NFL and BYU quarterback Steve Young. Robert Redford also maintains a home at the nearby Sundance Resort, just up Provo Canyon. ^ Kinder, Peri (2016-04-27). "Name of the Game: How Revere Health successfully rebranded". 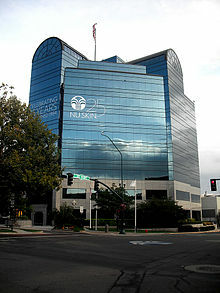 Utah: Utah Business. Retrieved 19 December 2017. 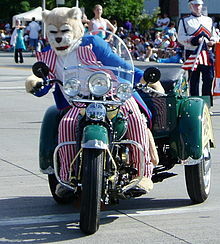 ^ "Provo Pride – Provo Pride Fest boosts LGBT visibility in Mormonism's 'Happy Valley'". 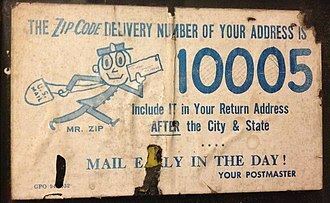 provopride.org. Retrieved 2016-06-28. ^ "Construction of Utah County Convention Center gets under way". Deseret News. 2010-06-15. Retrieved 2010-08-06. ^ a b "Utah Education Network". Utah Education Network. Retrieved February 12, 2014. 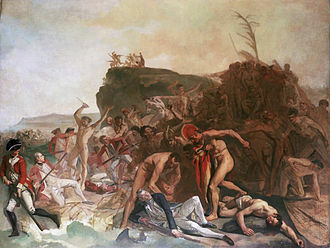 In some accounts they were called the Timpiavat, Timpanogotzi, Timpannah and other names. During the mid-19th century, when Mormon pioneers entered the territory, the Timpanogos have generally been classified as Ute people. They may have been a Shoshone band, since other Shoshone bands occupied parts of Utah, nineteenth-century historian Hubert Howe Bancroft wrote in 1882 that the Timpanogos were one of four sub-bands of the Shoshone. Chief Walkara, known as Chief Walker, was a noted mid-19th-century chief who led his people against Mormon settlers in the Walker War, the Shoshone and Ute shared a common genetic and linguistic heritage as part of the Numic branch of the Uto-Aztecan language family. 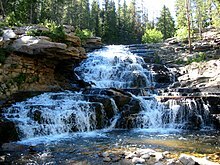 In 2002, the Timpanogos won a case against the state in the Court of Appeals upholding their traditional rights to hunt, fish. 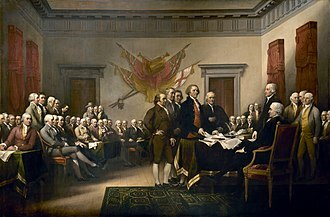 The court concluded that their relationship with the government was well-established. They have submitted an application and documentation to the Department of the Interior seeking federal recognition as an independent tribe. They were hunter-gatherers, living mostly on fish and wild game caught by the men and cooked and processed by the women and on the seeds, as part of their religion, in the mornings they gathered together and greeted the morning with song to express gratitude to the Creator. They were divided into clans, each with its headman, spiritual leader, the clans would band together for specific purposes, such as hunting. There was no division of the land, and people were free to travel to different villages and they developed an extensive trading network. The Timpanogos lived in the Wasatch Range around Mount Timpanogos, along the southern and eastern shores of Utah Lake of the Utah Valley and in Heber Valley, Uinta Basin, the band around Utah Lake became dominant due to the areas food supply. During the spring spawning season at Utah Lake, the tribes hosted an annual fish festival, Timpanogos and Shoshone bands would come from 200 miles away to gather fish. 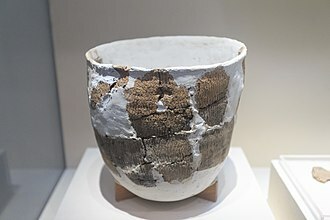 At the festival there was dancing, trading, horse races and it was an opportunity for young people to find a mate from another clan, since exogamous marriage was required. 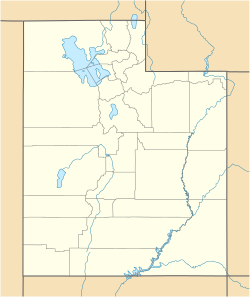 Utah County is a county in the U. S. state of Utah. 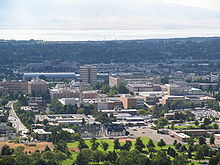 As of the 2010 census, the population was 516,564, the county seat and largest city is Provo, which is the third-largest city in the state. 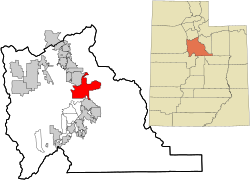 The county was created in 1850 and named for the Spanish name for the Ute Indians, Utah County is part of the Provo-Orem, UT Metropolitan Statistical Area as well as the Salt Lake City-Provo-Orem, UT Combined Statistical Area. 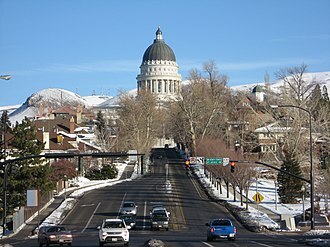 In 2010, the center of population of Utah was located in Utah County, Utah County is one of seven counties in the United States to share the same name as the state it is located in. 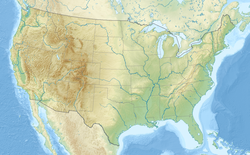 According to the U. S. Census Bureau, the county has an area of 2,144 square miles. Utah Valley lies at the center of the county, lined by the mountains of the Wasatch Range on the east, Utah Lake occupies a large part of the valley. The elevation ranges from 4,487 feet above sea level at the lake to 11,928 feet at the peak of Mount Nebo, the population density was 259 people per square mile. 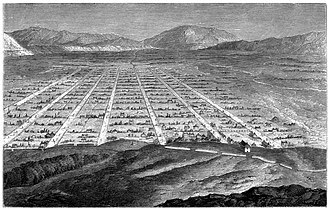 There were 148,350 housing units, at a density of 74 per square mile. 10. 8% of the population were Hispanic or Latino of any race,11. 6% of all households were made up of individuals, and 4. 4% were someone living alone who was 65 years of age or older. The average household size was 3.57, and the family size was 3.88. In the county, the population was out with 35. 2% under the age of 18,15. 8% from 18 to 24, 28% from 25 to 44,14. 5% from 45 to 64. The median age was 24.6 years, for every 100 females there were 100.3 males. For every 100 females age 18 and over, there were 97.7 males, at the 2000 census, the median income for a household in the county was $45,833, and the median income for a family was $50,196. Males had an income of $37,878 versus $22,656 for females. The per capita income for the county was $15,557, about 6. 80% of families and 12. 00% of the population were below the poverty line, including 8. 40% of those under age 18 and 4. 80% of those age 65 or over. 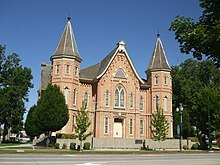 Utah County commissioners are elected at-large, as of 2015, the three county commissioners are William C.
Fort Utah was the original settlement at Provo, United States and was established March 12,1849. 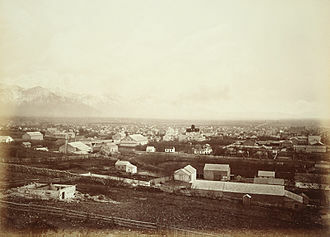 The original settlers were President John S. Higbee, and about 30 families or 150 persons that were sent from Salt Lake City to Provo by President Brigham Young. Several log houses were erected, surrounded by a 14-foot palisade 20 by 40 rods in size, with gates in the east and west ends, the fort was first located west of town, but was moved to Sowiette Park in April,1850. In late 1849, tensions between Ute Indians and Mormons in Utah Valley escalated after a Mormon killed a Ute known as Old Bishop, the Mormon and two associates hid the victim’s body in the Provo River. Details of the murder were likely withheld, at least initially, from Brigham Young, settlers at Fort Utah did, report other difficulties with the Indians, including the firing of weapons at settlers and the theft of livestock and crops. 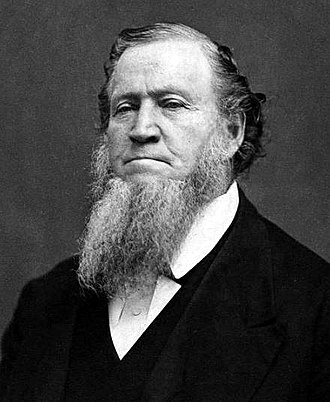 Brigham Young counseled patience, telling them to “stockade your fort, to attend to your own affairs, in the winter of 1849–1850, a measles epidemic spread from the Mormon settlers to the Ute camps, killing many Indians and heightening tensions. Approximately 2,400 athletes from 78 nations participated in 78 events in fifteen disciplines, held throughout 165 sporting sessions. 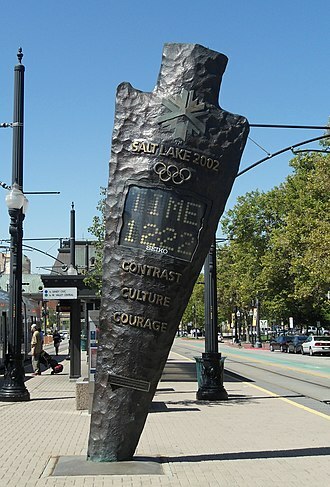 The 2002 Winter Olympics and the 2002 Paralympic Games were both organized by the Salt Lake Organizing Committee, Utah became the fifth state in the United States to host the Olympic Games, and the 2002 Winter Olympics are the most recent games to be held in the United States. These were the first Olympic Games under the IOC presidency of Jacques Rogge, the opening ceremony was held on February 8,2002, and sporting competitions were held up until the closing ceremony on February 24,2002. 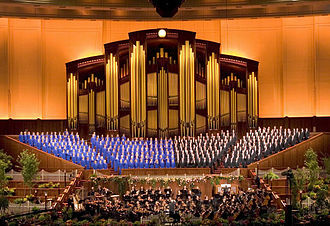 Production for both ceremonies was designed by Seven Nielsen, and music for both ceremonies was directed by Mark Watters, Salt Lake City became the most populous area ever to have hosted the Winter Olympics, although the two subsequent host cities populations were larger. 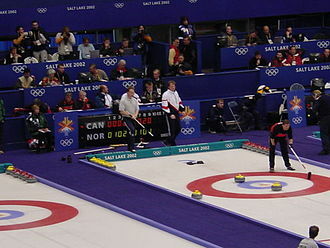 Following a trend, the 2002 Olympic Winter Games were larger than all prior Winter Games, with 10 more events than the 1998 Winter Olympics in Nagano, Japan. 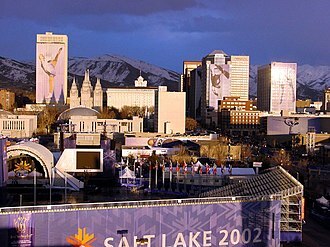 The Salt Lake Games faced a scandal and some local opposition during the bid. Nevertheless, from sporting and business standpoints, this was one of the most successful Winter Olympiads in history, over 2 billion viewers watched more than 13 billion viewer-hours. 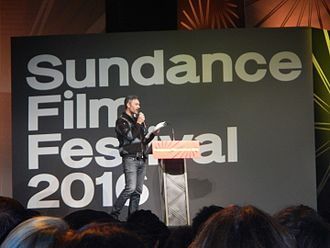 The Games were financially successful raising more money with fewer sponsors than any prior Olympic Games, the surplus was used to create the Utah Athletic Foundation, which maintains and operates many of the remaining Olympic venues. U. S. Federal subsidies amounted to $1.3 billion, Salt Lake City was chosen over Québec City, Sion, and Östersund, Sweden, on June 16,1995, at the 104th IOC Session in Budapest, Hungary. 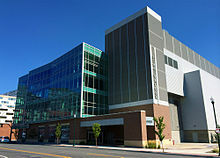 The 1976 Winter Olympics were ultimately awarded to Innsbruck, Austria, 1Because of the no-commercialization policy of the Olympics, the Delta Center, now the Vivint Smart Home Arena, was labeled as the Salt Lake Ice Center, causing some confusion for visitors. The Oxford Olympics Study established the outturn cost of the Salt Lake City 2002 Winter Olympics at USD2.5 billion in 2015-dollars and cost overrun at 24% in real terms. This includes sports-related costs only, that is, operational costs incurred by the committee for the purpose of staging the Games. The competition venues, the Olympic village, international broadcast center, and media and press center, average cost for Winter Games since 1960 is USD3.1 billion, average cost overrun is 142%. A total 78 National Olympic Committees sent athletes to the Salt Lake City games, Hong Kong, Nepal and Thailand participated in their first Winter Olympic Games. There were 78 events contested in 7 sports, in the following calendar for the 2002 Winter Olympic Games, each blue box represents an event competition, such as a qualification round, on that day. The yellow boxes represent days during which medal-awarding finals for a sport are held, the number in each box represents the number of finals that were contested on that day. All dates are in Mountain Standard Time Host country To sort this table by nation, total medal count, or any other column, several medals records were set and/or tied. Mount Timpanogos in the Wasatch Range is visible from much of Utah County. Missionaries review a mock teaching session in the TRC.